After graduating from Monmouth College, Jennie traveled quite a bit to pursue her dream of becoming a doctor. It is presumed that her travels in America were done by carriage, however, Jennie writes to her friend Emma of her travels over seas. She comments on the 15 day boat ride from New York to Rotterdam and how seasick she was stating, "...not very sick any of the time but so dizzy I could not stand on my feet, and ...assumed the recumbent position on deck, 16 hours of the 24". After arriving in Rotterdam, she took an express train Wiesbadan, Germany. She notes in her letter, "The trip requires two days by boat while I came by rail in 12 hours, and saw beautiful scenery enough for one day". The remaining of her letter tells of her travels through Holland by train. She finds her predicament of not being able to communicate to others and be certain she is even headed in the right direction as amusing. She states, "One fellow seemed to have a sort of vague idea of the signification of the words 'ticket' and 'luggage' which he continued to repeat in very much the same tone and manner of the faithful in their Ave Marias...". It wasn't until the trained reached Germany, since she spoke some German, that she knew she was on the right path. In the early 19th century the main mode of transportation revolved around horses often in the form of a carriage. Around 1830, railroads began to become prevalent in America and allowed for citizens to travel much farther and faster than previously. The addition of the railroad system in Monmouth, circa 1855, allowed Monmouth to become a major commercial hub. This allowed for the convenient transportation of goods between Chicago and Monmouth. Marine travel during this period did not see such a dramatic change. Boats were the only way to cross large bodies of water and even though there was some advancement, it was still overshadowed by the advances of the railroad system. Jenni Nicol, a Monmouth college graduate and Warren County native, describes her train trip. Another letter sent by Jenni Nicol describes the marine transportation of the time. The amount of time to cross the ocean is significantly higher than it would take by modern accounts. The C.B. 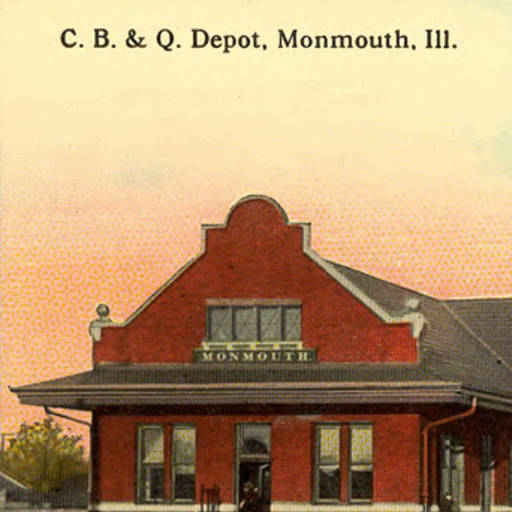 & Q. Depot was the Monmouth Illinois train depot during the 19th century and into the 20th century.